And on the motoring front, there is a new and friendly BMW/MINI dealer who really does work hard to make a sale. 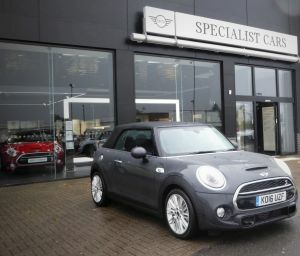 A keen fan of drop-head cars, BTN editor-in-chief Malcolm Ginsberg recently borrowed a MINI convertible from Specialist Cars, whose operation is just by M1/J11. To put things in perspective, the original Alec Issigonis Mini was launched in September 1959 as the Austin Seven and Morris Mini Minor. Production ceased in 2000, the first and last car now at the British Motor Museum at Gaydon. By the end of manufacture, 5,387,862 had been produced, including minivans, Riley Elfs, Wolseley Hornets, pickups, mini-mokes and a short-run cabriolet by the Rover Special Products team between 1993 and 1996. Various models were assembled abroad from UK-supplied ‘knock-down’ kits. The MINI was introduced in 2000, has been much updated over the years and is a runaway success all over the world. Its concept was British, but owner BMW Munich has underpinned its development from the very beginning. The story goes that American chief designer Frank Stephenson, getting ready to present the clay-model concept to the board, realised the model did not have an exhaust pipe. His short-term solution was to pick up an empty beer can, punch a hole in it, strip off the paint and push it into the clay at the back of the car. This just took just a few minutes. The overall design was so good that the board members told him not to change a thing, resulting in the distinctive exhaust tip seen in production cars today. Since it was introduced in 2004, more than 300,000 cabriolets have been produced and it has got better and better. The only downside is the actual soft-top, which does not tuck away properly and offers a very, very poor rear-view. On the plus side, the latest version takes just 18sec to open fully (there is a halfway setting as well), it offers very quiet running when up and is virtually windless with the wind deflector in place. You can get it with the Union Jack embodied into the roof too. 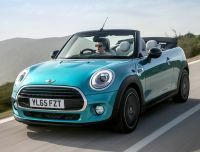 The current MINI as an open-top is available only as a MINI Cooper convertible. It really is a mid-size car, significantly larger than the original, 3.8m v 3.06m long and 1.7m wide against 1.4m. What it retains is the same nippiness as the BMC Mini, and its personality. The really big difference is the quality of the build. No wires (that often broke) for the door opening. These are heavy compared to the original due to modern safety features, but they do shut with a clunk. The 2017 MINI is a sophisticated, electronic-aided, very modern motor car, often borrowing parts and ideas from its big-brother BMWs. Even the lead-in model has a 0-62 of 9.2sec and a top speed 120mph. Getting on for 50mpg can be expected, far superior to the original. It is not the cheapest car in its market, with prices starting at £18,615 but with the John Cooper ‘Works’ variant capable of setting you back close to £30k. For 2017, the model continues much as this year’s car, the platform-based on the Oxford-built MINI Clubman, offering more comfort and space for those in the back. It is a little wider and a little longer and a little roomier than the generation it replaces, but it must still be described as a compact car. Once you are inside, the most obvious change is the removal of the centrally placed speedometer to the gauge cluster behind the steering wheel, which also includes multi-function controls. Where the speedo used to be is an 8.8in navigation screen (6.5in standard), but what was missing, and I for one would order on any new car if possible, was BMW’s excellent Head Up Display (HUD) at £450, an essential safety feature. Hopefully this will be on all new cars in the not-too-distant future. Extras you can buy include a rain sensor, which you might think standard on a car where the roof comes down (only £90 and part of the nav system/control centre). The base model tested has a six-speed gearbox and 1.5 litre three-cylinder turbocharged engine good for 134 horsepower. Diesel and automatic versions are available. There is no problem with structural rigidity, a problem with some soft tops, with BMW having fitted additional torsion struts in the front and rear underbody areas and adding an additional stiffening plate beneath the engine. There is a built-in automatic roll-over protection system. The test car had cruise control, reversing camera, 17in wheels and what is termed a ‘non-smoker package’, but that comes free. There are numerous options you can order, including heated seats, folding electric mirrors, and a ‘park distance control’. The colour and trim variations are countless. In terms of quality, the MINI Convertible is a BMW in all but name. In spite of its size, it still delivers the concept of "go-kart" handling, even allowing for a car weighing-in at 1.5 tons. Motorway cruising is exceptionally quiet and there is very little scuttle shake, to which convertibles are prone on poor roads. With the roof up, it feels and handles just like the saloon. 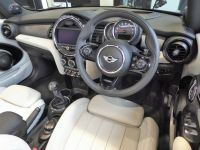 Price-wise, the MINI Convertible competes with the latest two-seater Mazda MX 5 (or Fiat version) and is a lot easier to get in and out of, plus it has the extra two seats, more often than not used as extra storage space. Then there is the Volkswagen GTI Cabriolet, but it lacks the appeal and is a tin top. Audi and Mercedes four-seat drop-heads are into another price bracket. The MINI roof is brilliant, but a long time ago Munich should have sorted out the back end, either with a copy of the Peugeot 207cc, or a means of properly tucking the canvas hood properly away.